Three sons of Thomas McCartney McCandless and Elizabeth Ann (Newman) McCandless, James Sutton (‘Sunny Jim’) McCandless, John Andrew McCandless and Lincoln Loy (‘Link’) McCandless formed McCandless Brothers in 1881. Thomas McCartney McCandless (September 6, 1821 – September 5, 1907) was born in Pennsylvania; he was a descendant of the McCartney family, who were the principal owners and founders of Indiana County, Pennsylvania. Eliza Ann Newman (April 25, 1826 – October 26, 1891) was born in Bedford County, Pennsylvania, the daughter of Peter Newman, a miller, born in Heidelberg, Germany, and of Jane Ferguson Newman. James Campbell was owner of the Honouliuli Ranch; it was mostly dry plains, needing only water to make it fertile. In July, 1879, John Ashley started drilling the first artesian well in the Hawaiian Islands in the rear of the James Campbell Ranch House at Honouliuli, Ewa District, on the flat land close to the sea. At a depth of about 250 feet, they found fresh water, which flowed in a small stream over the top of the pipe, the first well in Hawaiʻi, and also the first flowing well in the Hawaiian Islands. Over the next 55-years, McCandless Brothers drilled more than 700 good wells across the Islands. Their wells helped support and water the growing and expansive sugar and pineapple plantations including ʻEwa, Kahuku, Oʻahu, Waialua and other large producers, and also on the Islands of Maui, Hawaiʻi, Kauaʻi and Molokai. John was a member of the “Committee of Thirteen,” which took an active part in the overthrow of the Hawaiian Monarchy in 1893. From 1894 to 1898 he held an office under President Sanford B Dole, in his cabinet, and later became a member of the Senate. He was the first superintendent of public works under the territorial government, and while holding this office built the first road around Diamond Head on the sea side of the crater, and the lighthouse there. Link, as a boy, had a great desire to own land and cattle. His ambition has also been achieved. It was not long after he arrived in the Islands that he leased the lands here and there and formed huis to buy more. Link conceived the feasibility of diverting water from Waiāhole, Waikāne and Kahana, on the windward side of Oahu, through the mountain divide to the rich sugar lands on the leeward side of Oahu by means of a tunnel. John and Jim partnered on a downtown Honolulu lot and built the first modern office building in Honolulu, in 1907. It is five stories high (and also reported as one of only a few Honolulu buildings to feature a full basement,) built of lava rock – the McCandless Building (it is still standing at 925 Bethel Street.) Nearby is the still existing McCandless Block at 9 North Pauahi Street. A descendant in the family is Maxwell (Max) McCandless Unger; Seattle Seahawks center, he’s a ProBowler, Super Bowl winner and graduate of Hawaiʻi Preparatory Academy. His family manages McCandless Ranch in South Kona. 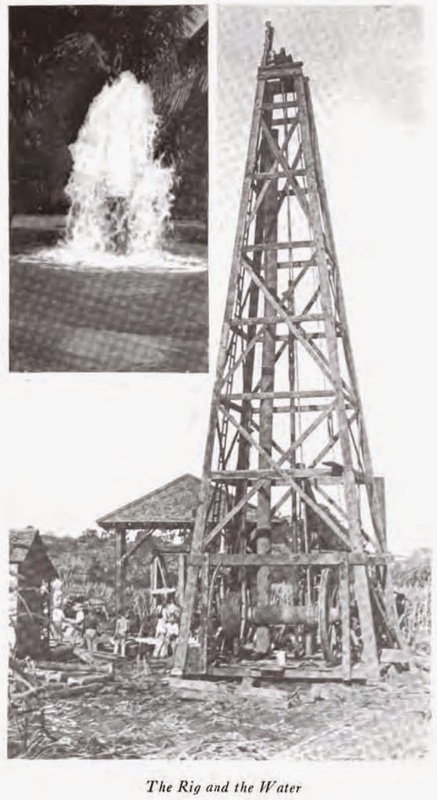 The image shows a McCandless drill rig and water. (McCandless) In addition, I have included more related images in a folder of like name in the Photos section on my Facebook and Google+ pages.